My first sparring session (or ‘roll’, as its known colloquially) was an education into how vulnerable we are. It’s comparable to being thrown into a pool without knowing how to swim, or trying to control a boa constrictor. I remember being absolutely manhandled. Using pressure and techniques completely foreign to me, I was dissected in a cold, calculating manner. Heavy pressure, technical grips and technique rendered me completely helpless and pinned to the mat. It wasn’t long before my opponent reached ‘mount’ and a cross-collar choke was sunk deep. The blood flow in my carotid arteries slowed down like water in a kinked garden hose and the oxygen to my brain began to fade. I tapped – a physical signal of submission. The choke was released and for the next hour and a half, I was run through a human meat-grinder, where opponents of differing body types used their individual arsenal of positioning and technique to break me down and make me realise my own fragility – over and over again. Thus comprises what’s known as the Gentle Art. Maybe you’ve caught a glimpse of it in a cage fight or action movie. Brazilian Jiu-Jitsu (BJJ) has been around for just over a century, but has only been in New Zealand for just less than 20 years. 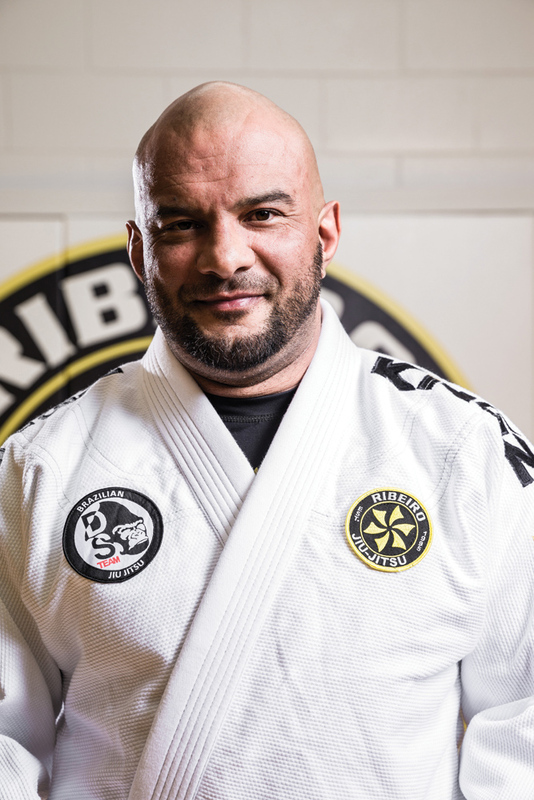 Douglas Santos is a 4th degree Brazilian Jiu-Jitsu black belt, founder of DS Team BJJ-Ribeiro Jiu-Jitsu NZ and pioneer of BJJ in New Zealand. I talked to Santos about developing the sport in New Zealand, competition and mindset, and how philosophies learned on the mat are applicable to real life. What was life like growing up in Florianopolis, Brazil? Florianopolis is one of my favourite places in the world. I spent all my life in Floripa. Basically, surfing was my first contact with sport and the guys that took me surfing were the same guys that introduced me to Jiu-Jitsu. Surfing and Jiu-Jitsu has always been part of my life in Floripa. Being an island and surrounded by waves, everybody surfs and everybody does Jiu-Jitsu, it’s a perfect combination. Surf in the morning and Jiu-Jitsu at night. What led you to learning the art of Brazilian Jiu-Jitsu? I didn’t really look for Jiu-Jitsu, I shifted towards Jiu-Jitsu in a funny way. I worked for someone that was teaching private Jiu-Jitsu sessions. He actually gave me my first surfboard and my first gi, [and is] a very close, good friend of mine. He needed somebody to be a dummy to practice his moves on, when he was doing private sessions with Grand Master Tonicão. It ended up I liked being a dummy and I felt something powerful there, and I always looked up to Jiu-Jitsu guys as good role models. I started when I was 15, then I started getting involved into it deeper and deeper – it’s been 30 years since then. Thirty years is a long time to commit to not just a martial art, but to anything! What do you think is the best way to describe BJJ to the average person? Nowadays the easiest way is to say: “do you watch the UFC? Do you see those guys in the cage and what they do on the ground? That is what I teach.” But to explain it in a better way, I would see it as a grappling system, based in self-defence. There are a lot of black belts in Jiu-Jitsu now who don’t know self-defence but only know how to win tournaments. 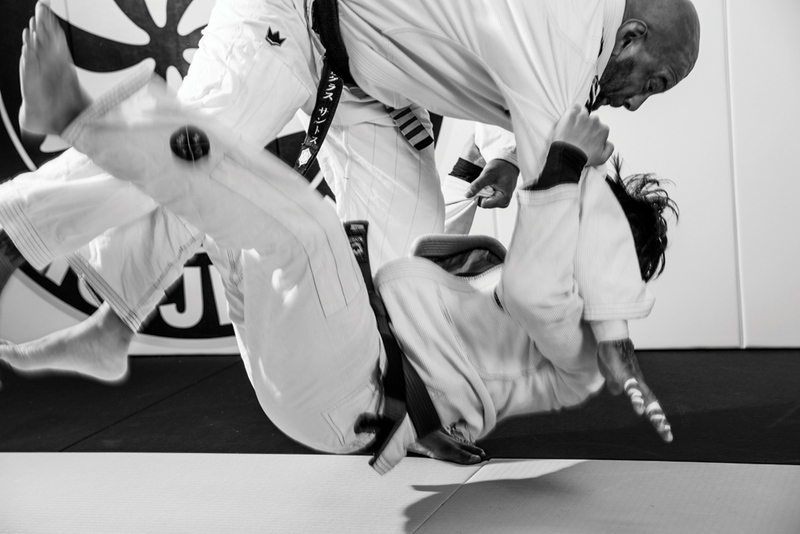 In my view, Jiu-Jitsu has always been the most powerful self-defence system, therefore people can use it to compete, to use for their own wellbeing or just to feel confident. It’s a grappling ground-fighting system based on leverage, locks, chokeholds and sweeps. BJJ has a reputation for being a sport where it is very difficult to get a black belt. In other martial arts, people can get their black belts quite quickly, but they say in BJJ that a black belt can only be obtained after 10 years of consistent training. For you, what was the biggest challenge on your journey to black belt? There’s a common question: “how long does it take the average person to get a black belt in Jiu-Jitsu?” The average person doesn’t get a black belt in Jiu-Jitsu. Jiu-Jitsu is totally made for you to not get your black belt. Along the journey you might feel disappointed, frustrated and depressed because you might think your Jiu-Jitsu isn’t working. Jiu-Jitsu, like life, is sometimes going to crush you – it’s up to you to use the right technique and escape. The biggest challenge for me was sticking with it. I had a period where I stopped training for two years, and that was the worst period for me. I was lost, I was getting in trouble, I wasn’t focused and I wasn’t confident. If there was a period in my life where I wasn’t feeling good, it’s when I wasn’t doing Jiu-Jitsu. So when you got your black belt, some time after you made a decision to come to New Zealand, tell me a bit about what led you to New Zealand? When I was in Brazil, I had a physiologist that was helping me with my physical conditioning and he used to have holidays around the world, you know… Australia, and he ended up in New Zealand. He told me: “Man, you need to go to New Zealand. You have a lot of charisma, you have a lot of tattoos, you’ll blend in with the island people, just like one of them.” So I came here. When I got here, I was actually a brown belt, in a good stage of my brown belt. I realised that there were no black belts here, there was no Jiu-Jitsu here at all. So I spent a year here, trying to teach in small places, in private rooms and trying to get involved with Jiu-Jitsu. After a year here, I went back to Floripa, Brazil and back into training with my instructor, Murilo Rupp. Straight after the class he promoted me to black belt in a very unusual, simple way. There was no celebration, no firecrackers or fireworks, he just said: “your time has come”, and he took his own black belt from his waist and gave it to me. He said: “I trust that this will set the direction of your life.” For some time, when I got back to New Zealand, I felt really lost. I didn’t really have anybody in New Zealand to measure my Jiu-Jitsu and see how good or how bad I was. I was concentrating on raising a school and teaching and developing Jiu‑Jitsu here. Fast forward 18 years, and now you have your own school, built from the ground up; you helped spark the BJJ movement here in New Zealand. What was it like during the early days? The early days of Jiu-Jitsu in New Zealand were really funny. After my first year or two here, I decided to run a Jiu-Jitsu tournament. I had seen a poster where someone was promoting ‘Jujitsu’, spelt with a ju – a Japanese style. It had a picture of Grand Master Jigorō Kanō, the founder of judo and Grand Master Hélio Gracie, the founder of Brazilian Jiu-Jitsu with the words ‘Jujitsu vs Judo – afterwards beers and sausages’ underneath. It was really funny, so I thought to myself: “I’ll run a proper Jiu‑Jitsu tournament”. I ran the first Brazilian Jiu-Jitsu Open at Auckland University in 2001 or 2002 and still have the T-shirt at home somewhere. We set up the whole place and had a Brazilian DJ playing music. Everything was set for the first Brazilian Jiu-Jitsu National New Zealand Open and 45 people showed up. Between those 45, precisely 32 were my students. Long story short, today you will see so many places that promote Jiu‑Jitsu here in New Zealand. I still firmly believe that DS Team Ribeiro Jiu-Jitsu New Zealand is the only school, [though] because based on the the way that we’re doing things, we can call this place ‘A School of Jiu-Jitsu’. The proof of that is that we’re part of the University of Jiu‑Jitsu based in San Diego. It was either 2010 or 2011 when I met Xande Ribeiro in Abu Dhabi and we became friends. Ribeiro being Ribeiro, he’s in the Hall of Fame, seven times world champion – a legend. We always talked about me being part of Ribeiro, being part of the University and being part of their association because they are the best in the business and we have the same style. We really believe in the things we teach – loyalty, discipline, courage and family values. All these things made us pretty similar and we were following the same path. The transition was pretty simple. Sensei Saulo Ribeiro accepted me and welcomed me into the family as one of their own. It’s been almost four years and I couldn’t be happier. I’m proud to have the Ribeiro patch on my gi. What is it like having these legends and Hall of Famers like Xande and Saulo there to give you support? You can contact them whenever you like. It is incredible. I always talk to Saulo about this. When I was a kid, during the early days of my Jiu‑Jitsu, I found a magazine. The picture had Saulo mounting someone and choking a guy. I think it said something like “Saulo – six times Rio State Champion”. I just thought “Wow!” I looked at that picture and saw the focus on his face and the grinding that he was putting into that choke. At that moment I was, like: “man, I want to be just like that guy!” And now I go to San Diego and stay at his house, I have him and Xande come stay at my house and I can call them my brothers. We’re in this journey together. It’s just unbelievable how I can call Xande when I have problems from certain positions, and I can call Saulo for advice: “should I stay in this division when I fight, what should I do?” The dream really came true in 2016. It was the first time I actually competed beside Saulo. Just being with him and going to the bull-pen, warming up together, going to the weigh-in together, having that energy from a champion… for me, that was my golden medal. The dream to be World Champion isn’t about what’s going to get me more students or less students or what makes people respect me more or less. It is a personal achievement for myself – to come from zero, from having a really tough upbringing and growing up in Brazil, to being successful in life, to be a champion in life. Winning a gold medal, for me, is a personal achievement. The drive for me is the same drive that makes me get up every single day. The energy from people is what drives me every day to get out of bed. It’s the same energy that motivates me to be a good role model, and I truly believe you cannot be an example to someone if you don’t do it [yourself]. So if I want to teach a move to my students, if I want my students to be confident with the move that I’m showing, I need to be confident in myself. Martial arts can often be regarded as a way of life. Can you try and tell the average person what can they learn from BJJ to improve their life? I really believe in the things I say in my school. I really like to motivate people. I got to New Zealand 18 years ago with a backpack and US$400 in my pocket. Now I compete all over the world. I have a school with over 100 members. I reach and I touch people through this sport, through this lifestyle. For me, I don’t see Jiu-Jitsu as a sport, I see Jiu-Jitsu as the way I live. Life for me is much easier through Jiu-Jitsu eyes. Everything I do, everything I am, is Jiu‑Jitsu. I tell my students that you won’t find anything that reflects real life like Jiu-Jitsu. Everything that happens on the mat is similar to what happens in life: you’ll be training with a big guy and you have a bad day, he’ll mount you and you’ll feel that pressure all over you. It is the same thing [as] if you don’t have a job or [if you’re having] problems in relationships or someone close to you is having health problems… sometimes that pressure can suffocate you so much. If you see life through a Jiu-Jitsu [lens], you’ll know that bad times don’t last forever. If you wait for the right time, use the right technique, take a deep breath and take the pressure – you can overcome your obstacles. That is the biggest lesson that Jiu-Jitsu can give to you, the confidence that you are always going to find a way out. Even through the worst situations, you see this happen daily in the school and at tournaments. You are in the worst position ever, you are losing, you are about to quit – but you take a deep breath, you wait for the right time and you overcome. I guess, for me personally, when I look at Jiu-Jitsu, my biggest takeaway isn’t just the physical technique I’ve learned, but the mental aspect. It doesn’t matter if you have a good day or a bad day, when you train, you are just here in the moment. It also doesn’t matter if you are big or small, fat or skinny, tall or short, if you’re a fast learner or a slow learner. It took me almost 15 years to get my black belt, some people got it in four – it doesn’t matter. If you are rich or poor, it doesn’t matter. If you are strong or weak, it doesn’t matter. 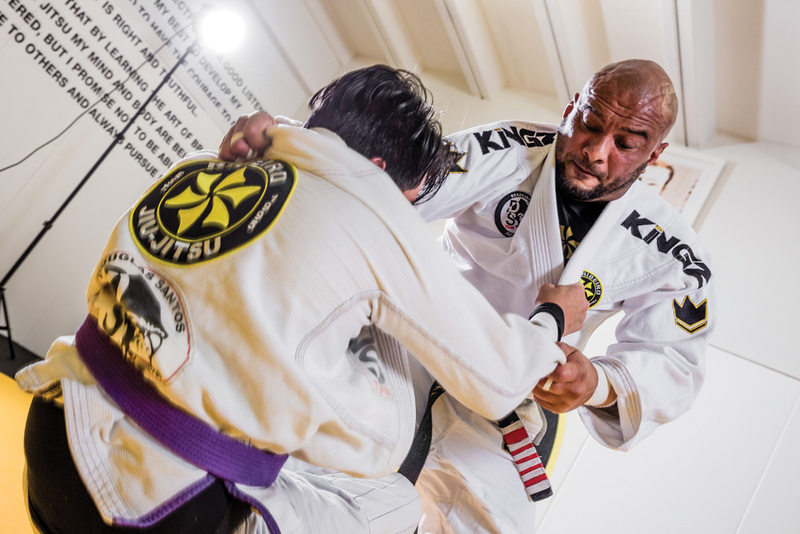 When we put on the gi, we are all the same, we feel the same. Sometimes you’ll hear: “oh, I have a goal, I’ll start on Monday.” Why Monday? Start it now. “It is never too late, you are never too old to start from scratch again” – that’s the biggest saying we have at the University of Jiu-Jitsu. When you walk in through those doors, you’ll see it in big writing on the wall, and I really believe that. It also says on the wall: “A black belt is a white belt who never quit”. You can go back and apply the same principles to things in life. If you want to be successful in life, it’s simple: don’t quit. What is Brazilian Jiu – Jitsu? Brazilian Jiu-Jitsu is a grappling and ground fighting system that promotes the concept that a smaller, weaker person can successfully defend themselves against a stronger and larger assailant using leverage and correct technique. There are no strikes in Brazilian Jiu-Jitsu; the fight is taken to the ground with take downs, where joint locks and choke holds are employed to immobilise an attacker. 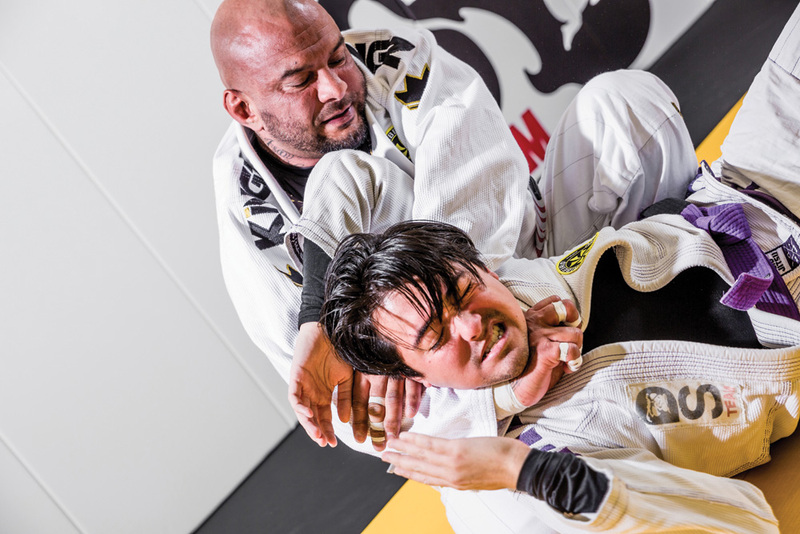 BJJ’s ground fighting emphasis gives it a unique advantage over striking martial arts and the conventional stand-up approach seen in physical confrontation. Along with the obvious fitness benefits and commitment to discipline, the nature of sparring (or rolling) in BJJ helps promote mindfulness – a concept in psychology and meditation that places importance on focusing on the present to eliminate worries over past or future.